Raiders kicker Sebastian Janikowski just banged home three 50+ yarders in his team's win over the Texans. A few weeks ago he tied the NFL record with a 63-yarder on a warm night in Denver. I was curious about just how much more successful he was at longer distances compared to the average kicker, so I dug up the data. The graph below is his FG success by line of scrimmage (not kick distance) compared to the league average. His advantage, particularly at longer distances is evident. It looks like a about a 5 to 8 percentage point advantage at extreme ranges. I'm still not sure Janikowski was worth a first round pick, but he clearly stands out among other kickers of his cohort. Here are a few selected Pro-Bowl kickers' success rates. 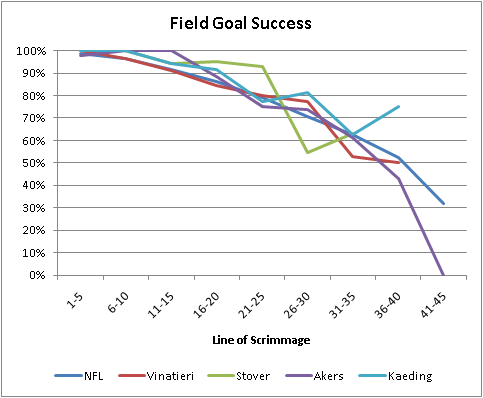 Vinatieri is purely average, as is Akers. Kaeding is slightly above average, and happens to have hit 3 of 4 kicks in the 36-50 bin. The kicker I find most curious is Matt Stover. He's money in the short and mid ranges, but he was clearly range-limited. In fairness, the data only goes back to 2000, several years after the start of Stover's career. I suspect some of his dramatic drop-off outside the 25 yard LOS is due to an end-point effect--that is, an arbitrary accident of where the LOS bins were selected. I've always felt like it should be taken into account how many times kickers are even sent out to attempt long field goals. Perhaps in Kaeding's case, he's not particularly trusted to make a 52-yarder and so he doesn't get the call in the first place. What the field goal success percentage doesn't tell you, is how many attempts there were. 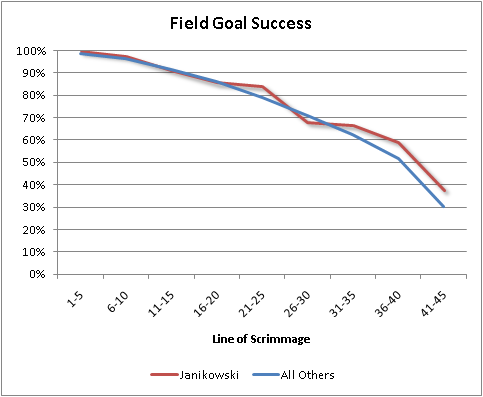 If Oakland is confident in Janikowski's leg, they may well be attempting more field goals from longer distances than other teams. So if he's 5 to 8% advantage, that may result in many more points on the board than the average field goal kicker. Do you have that information? Completely agree. I've got all that data, but the story starts with his success rates. One thing at a time. There's possibly a paradox here, however. The better your kicker, the more often you kick instead of go for it in no-man's-land, which is more often than not the better play. Thanks! One of the reasons I love your blog is that for a football fan, you provide great examples and explanations of where statistics illuminate what happened and also examples of how statistics struggle with paradoxes. Or if I remember my logic training, how frameworks deal with anomalies. Why can't statistics teachers use examples from football? So, because it's hard to measure percentage vs. attempts vs. intangibles, can we instead look at the EPA implications? In other words, where is the average NFL team's break-even point? ...and where is Oakland's? I would take into account this year's team and their specific ability to convert on short plays, vs. the league average. You know, in your copious free time. Ugh, clarity... sometimes I lack it. By "break-even-point" I mean the dividing line between the punt and FG regions of the tripartite graph featured in your (and Romer's) 4th-down analysis. 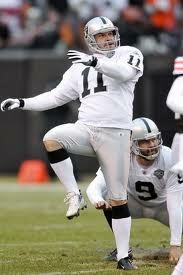 Does Janikowski's range and accuracy act to move the peak to the right or otherwise enlarge the FG region? I think JR is right--obviously OAK should go for it in 4th & short between the opponent's 30-40 in almost all situations--but what would their expected points be on 4th & 10+ from, say, the opponents 38 (55 yd FG), compared to going for it? Some coaches with "weak-legged" FG kickers might punt in that same situation, and probably most would--esp. if the game is close and has more than 7 minutes on the clock. A coach who is winning would, even toward the end of the game. The Raiders, and maybe a couple of either teams, would prob. send out their K for the FG. They just have more faith in their kicker to convert the FG than in their offense. And most don't have enough faith in either, and send out the punter. As a Raiders fan, this makes sense, since he seems to miss from long range quite a bit. With regards to going for it vs. kicking the field goal: in the 2005-2009 era for Oakland, our offense was so terrible that I would be our WPA and EPA both improved anytime we kicked a field goal vs. went for it, since our QBs during that era were Aaron Brooks, Daunte Culpepper, Andrew Walter, and Jamarcus. So I really doubt we gave up many points with those long field goals, since the offense was beyond atrocious. It's possible that Kaeding's advantage is weather-related... Denver, warm weather, and domes are all easier to kick in than northern outdoor stadiums. I was going to say the same thing about Janikowski, Tarr. Granted, all of his home games aren't as nice as Kaeding's. Oakland has atrocious turf early in the season while the field is shared with the Athletics, and later in the winter, being below sea level often leaves the turf less than ideal to plant and kick out of.